March 16, 2016, 1:46 p.m. The paper was targeting 180,000 daily app users by the end of 2016. Today, it has about 26,000. By Laura Hazard Owen @laurahazardowen March 16, 2016, 1:46 p.m.
A couple of weeks after an earnings report revealed that The Toronto Star isn’t attracting as many tablet app users as it had hoped to, Star publisher and Star Media Group president John Cruickshank announced that he’s stepping down in May. While audience size has been lower than we initially anticipated, we are making steady progress in building readership. Daily audience engagement metrics are strong and advertiser response has been very positive. 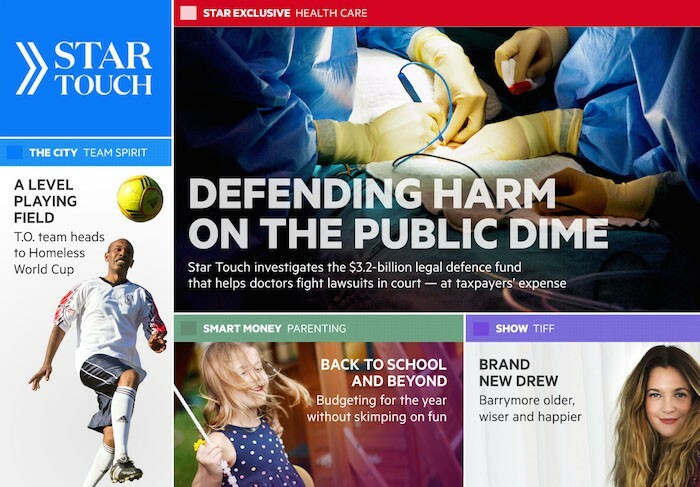 Star Touch hit 200,000 downloads on Apple and Android in January (it hit 100,000 downloads in November) and says it has 50,000 user sessions per day. But those sessions come from only 26,000 daily users. Torstar said last fall that its target was 180,000 daily users by the end of 2016, but on Wednesday, a company spokesman said its current expectation was for daily users to reach 100,000 by that time. Torstar also said it expects Star Touch to break even by the end of the year. POSTED March 16, 2016, 1:46 p.m.
Owen, Laura Hazard. "The publisher of The Toronto Star, which is betting big on an expensive tablet edition, is stepping down." Nieman Journalism Lab. Nieman Foundation for Journalism at Harvard, 16 Mar. 2016. Web. 23 Apr. 2019. Owen, Laura Hazard. "The publisher of The Toronto Star, which is betting big on an expensive tablet edition, is stepping down." Nieman Journalism Lab. Last modified March 16, 2016. Accessed April 23, 2019. https://www.niemanlab.org/2016/03/the-publisher-of-the-toronto-star-which-is-betting-big-on-an-expensive-tablet-edition-is-stepping-down/.